Not everyone is a candidate for rhinoplasty: A new nose may have once-upon-a-time been a rite of passage for those who could afford it. Today we recognize that some degree of nose prominence and ethnicity is not only OK, it can be beautiful. That being said, overly bent, curved or otherwise problematic noses can be properly treated in the right patients by the right surgeon! 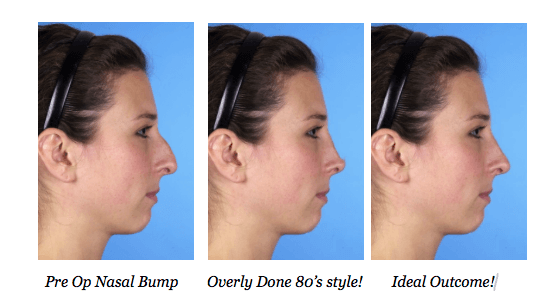 There is more finesse and artistry to rhinoplasty than just reducing size: Old fashioned nose job surgery was a reduction operation only-- the bone and cartilage structures were trimmed away in every case, creating a sometimes identical result in every patient. Too small a nose rarely matches a persons other features, often has blocked airflow , and can still have noticeable deviations and protrusions. Taking from some areas and building up other areas is the key to a talented surgeon's outcomes. If your surgeon does not routinely use such techniques as spreader grafts, fascia grafts, or septal resection when needed, then their techniques might be outdated. Not every tip has to reach for the sky! : While some people can have very upturned or pointy nose tips by nature, it is uncommon and should not be the goal of every nose surgery. Keeping the tip balanced with the profile height with minimal projection beyond the height of the middle nose creates a natural contour. Computer visualization is not optional. Every patient can see an estimate of their nasal shape and surgery result prediction with current technologies. Not only do simulated views help patients with their expectations of a result, it helps the surgeon with setting a realistic goal to achieve. These images are not perfect or a promise of actual results, but they are helpful and usually pretty close to the outcome. Open, closed and in between: Your surgeon should be very comfortable with modern open rhinoplasty as well as closed approaches. These are different techniques for exposure of the nose structure below the skin. Patients should not be too concerned over whether their surgeon prefers the open approach or closed approach in their case, but the surgeon should have a good reason for choosing one over the other, and should have the skill to use open when needed, particularly for revision and correction cases. Come see us in our Purchase NY offices to learn more about best choices in rhinoplasty surgery. Dr. Michael Suzman and staff are located within easy travel time to NY, NJ, Greenwich CT, and Manhattan. We are 7 minutes from Westchester County Airport (servicing major airlines and private FBO for NetJets and other private carriers).